March 24-25, 2012: Urban Farmers and Vegetable Gardeners Symposium featuring Will Allen Sign up for more information here. Feed Denver has excelled in our first years of operation, creating a network of collaborating organizations proficient in production, business, and education. 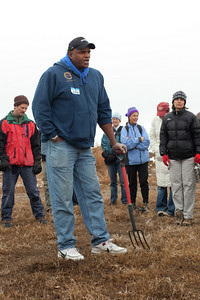 Will Allen, 2008 MacArthur Fellow, and his organization, Growing Power, recognized Feed Denver as Growing Power’s Regional Outreach Training Center (ROTC) of the Rocky Mountain Region in 2009. The vision for a Growing Power ROTC is to provide Growing Power’s technical training support at a regional level that explores and understands the unique needs and opportunities inherent in each area, "inspiring communities to build sustainable food systems that are equitable and ecologically sound, creating a just world, one food-secure community at a time." Being a Growing Power ROTC, Feed Denver will host “From the Ground Up” type workshops for the region and will receive program support to plan and develop a Community Food Systems project inspired by Growing Power's Community Food Center and Projects. 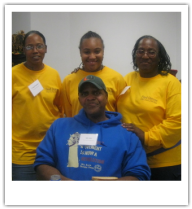 Will Allen with our Community Steward Farmers Trineka Freeman, Kasmira Thompson, and Paula Thompson at the Black Urban Farmers and Gardeners Conference in Brooklyn, NY in 2010. It was a great weekend! We had over 100 participants for the workshop and 100 students for the youth event. Will Allen and his team inspired us all as they showed us what it's all about! Even though we had a blizzard that weekend everyone still showed up...even the second day! We learned about the importance of food production in cities and how urban agriculture can impact a community. We created large scale composting systems with a worm depository and built a hoop house and aquaculture structure. We also learned about bees in the city, chickens and eggs, and made goat cheese. We had an amazing panel discussion by professionals working in all areas of planning and developing about the growth of agricultural uses in cities. But, probably best of all, we met an amazing array of individuals doing amazing things all over Denver, Colorado, the Rocky Mountain Region and beyond.